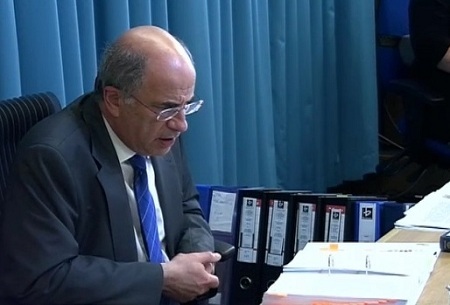 Leveson – are we heading for statutory independent press regulator? Thursday looks set to be a big political day with three Westminster by-elections and the publication of the Leveson report. Dave got his copy this morning and no doubt they’ll be working hard on his response planned for tomorrow afternoon. One possible issue is that the PM and DPM could make separate statements. At PMQs today we saw different viewpoints from backbench Tory MPs pointing to splits in the blue team. This morning the Media Standards trust issued the findings of a YouGov poll that it has commissioned. It’s all a tricky issue for Dave to deal with. Will state regulation happen? I don’t know. Could EdM be the only one left standing? Does today’s news put Dave’s future in doubt? Today’s dramatic announcement from the Crown Prosecution Service isn’t good news for David Cameron and must raise the prospect of him not making it through as leader to the general election set for May 2015. There is a growing anti-Cameron faction within the parliamentary party and there must be a possibility that this could add to it. This combined with the growing chorus for Vince Cable with the Lib Dems opens up the prospect that the only one of the three main party leaders still in post at the general election could be Ed Miliband. Is it going to happen? No idea but it’s worth a punt on Betfair’s “leaders at the general election” market. I’ve just had a little flutter on EdM only at 25/2 and EdM amd Nick Clegg at 12/1. Whatever these prices have the potential to move in sharply. 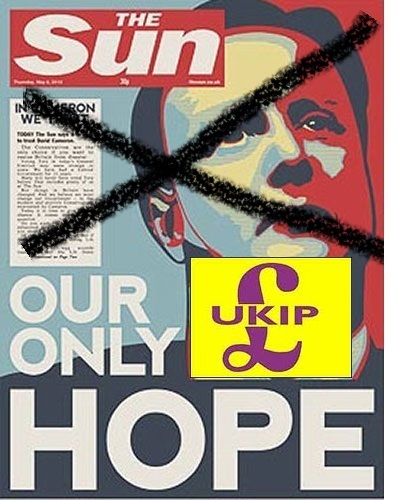 Could the Sun end up turning to UKIP at the next general election? Might its days of â€˜backing the winnerâ€™ be over? One consequence of the phone hacking scandal is that thereâ€™s almost no chance of The Sun backing Labour in 2015. Ed Miliband has gone out of his way to pick a fight with the Murdochs and itâ€™s doubtful whether heâ€™d want the endorsement even if it were on the cards, which it surely isnâ€™t. So if itâ€™s The Sun wot wins it then it will back the Tories then? Well yes, if you accept the â€˜ifâ€™. Despite the rise in the share of minor parties â€“ a rise seen in many countries at the moment â€“ the leader of either Labour or the Conservatives is overwhelmingly likely to form the government after the next election. The Sunâ€™s claim was always overstated in 1992 and is even more so now. The Toriesâ€™ lead dropped in the polls after The Sunâ€™s backing in 2009 and they failed to win an outright majority (though the paperâ€™s election day issue was primarily an endorsement of Cameron and he did become PM, so they did back the winner in that sense). Furthermore, papers simply donâ€™t reach as many as they used to – newspaper circulation in general has been falling for years and thereâ€™s every reason to assume that will continue. On top of that, The Sun appeals most to the sort of demographic which has seen one of the biggest falls in voter participation since its alleged 1992 triumph. Not that this is to say that the paperâ€™s stance is irrelevant; far from it. If their positive support has little effect, their negative reporting can be very important both in its ability to reinforce public perceptions through repetition of minor but memorable examples, and in disrupting a party from re-establishing its own narrative. Thatâ€™s true of other papers too, though The Sun â€“ with the biggest circulation and a more sensational style than some others â€“ has most scope to do so. Is it still interested in backing the winner and so preserving the myth of its impact? 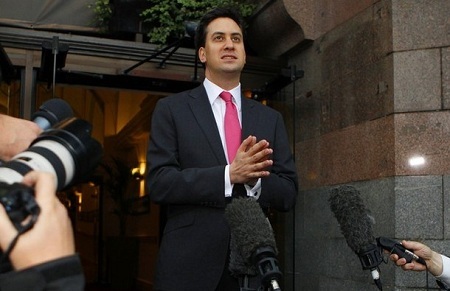 Given Milibandâ€™s refusal to play the game, there are good reasons for it not to be. If the Tories look well set to perform somewhere near their 2010 score, The Sun is likely to remain on-side: the temptation to keep up its record and do its best to prevent a party clearly hostile to News Internationalâ€™s interests taking power would likely be too great. On the other hand, if â€“ as is currently the case â€“ the Tories arenâ€™t likely to form a government, the risk to its reputation involved in backing the loser are greater than in not backing the winner. With the Lib Dems and Labour surely out of the running for a Sun endorsement, might the EU-hostile paper take the opportunity to skip all three established parties and back UKIP? Thereâ€™s an awful lot of Euro-water to flow under the bridge before 2015, not least this weekend. Thereâ€™s even an outside chance there wonâ€™t be an EU by then. Assuming that there is, and that itâ€™s more integrated than now â€“ the most likely scenario â€“ UKIP will offer a very attractive protest vehicle both to voters and papers appealing to them. Indeed, it already does looking at the polls. The biggest risk in such an endorsement is probably UKIP itself, still a pretty amateur organisation. Even so, in the relative game that is politics, it may end up for The Sun as the least unattractive option. What, if anything, is Leveson going to say about Hunt? Could Cameron be put on the spot about his handling? The hearing stage of the Leveson Inquiry into the media is drawing to a close with the prime minister, David Cameron, being today’s witness. It’s perhaps easy to forget the prime purpose of the Inquiry which is to “make recommendations on the future of press regulation and governance consistent with maintaining freedom of the press and ensuring the highest ethical and professional standards. The process, I’d suggest, has got somewhat knocked off course by the revelations in April of the emails and text exchanges between Jeremy Hunt’s SPAD and the News International lobbyist. Given the time that’s been spent on Hunt it’s hard to see how the judge can ignore this aspect. Yet he will want, surely, for this not to overshadow the recommendations he makes in relation to future media policy. So is Leveson going to say anything specifically about Hunt and if so how and when? My guess is that if he is going to do something we’ll get a an idea today. Today on PB I’m out in London all day and this evening and there will probably be a continuation thread this afternoon. Was Dave right – Hunt is an open goal for Labour? Does the PM think he’s on shaky ground? Inevitably on the day of the Labour-instigated on Jeremy Hunt debate Ed Miliband devoted all his six questions at PMQs to the issue that will be voted on later. There was was strange line from Cameron. He claimed in the exchanges that the issue was an “open goal” for Miliband. Does that mean that the PM thinks that he is on shaky ground? It certainly came over like that. For what was apparently an attack on Miliband’s performance ended up raising questions about the PM’s position. Aside from I thought both leaders did well and we got a taster of what’s to come. 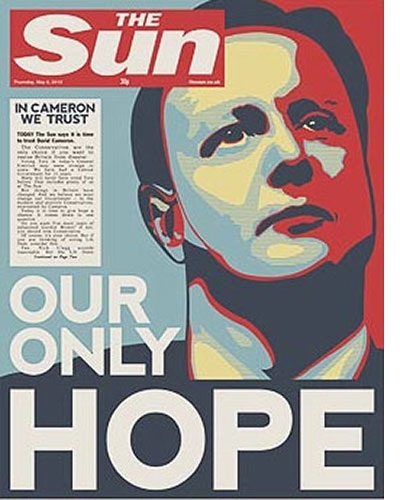 In spite of the backing of the Sun, of course, Dave didn’t win a majority. His party’s national vote share edged up just 3.7% and in spite of winning 100+ seats the Tories fell short. The final divide was the Conservative party 306 to 344 non-Tory seats. The 2010 outcome was unlike the paper’s endorsements at the 1979, 1983, 1987, 1992, 1997, 2001 and 2005 elections. I also wonder whether there would have been the continued media interest in hacking if Andy Coulson had not become the new PM’s media boss when Cameron arrived at Number 10. For all sides of the “deal” was it worthwhile? Is Peter Oborne right – Dave’s job could be on the line? How dangerous is this week for the PM? There was, I believe, a degree of complacency in relation to Cameron in the previous thread on which of the three main party leaders would still be there at the general election. He’s still got a pile of hurdles to surmount. This week sees Dave and other leading figures including George going before Leveson as well as the Labour-generated debate on his handling of Jeremy Hunt. The real danger for ministers is that there’s a lot of cross-checking going on between the evidence given under oath to Leveson and a number of commons statements. In a Telegraph article over the weekend the reporter who did tonight’s Channel 4 Dispateches programme, Peter Oborne, highlighted possible differences between the evidence given under oath by Andy Coulson and Cameron’s statements in the house. “As David Cameron prepares to take the stand at the Leveson Inquiry, Peter Oborne investigates just how close the Prime Minister got to the Murdoch empire. Did the Tories agree to help the mogul secure a business deal worth Â£8 billion? Oborne speaks to those close to Cameron, reveals new insight into his relationship with Murdoch’s inner circle and explains the magnitude of the political crisis now confronting the country. So a tricky few days ahead. Cameron in the past has always been at his best when his back is to the wall. Will that carry him through the next few days. My guess is that it probably will. What about a Leveson-style inquiry for the banks? Surely there are vital lessons to be learned? When something goes wrong, people inevitably look for someone to blame and politicians are often keener than most to assign blame, not least because if they get in early enough, thereâ€™s a better chance that the blame wonâ€™t land on them. All of which makes it surprising that the governmentâ€™s not commissioned any overarching inquiry into the causes of the financial crisis – plainly the biggest thing to go wrong for many a year. Why not? Partly, itâ€™s because the nature of the crisis has required solutions to be implemented sooner rather than later so the timescales donâ€™t necessarily fit with inquiries which can take years. Also, there have been a series of reports looking a various aspects of the crisis, so itâ€™s not as if itâ€™s gone uninvestigated. Even so, the Leveson Inquiry deals not just with the specifics of phone hacking but also the culture of the media and its relations with those it reports on. Itâ€™s arguable that given the consequences of the crisis, thereâ€™s a massively greater public interest in investigating not just the details of financial regulations or how well the Treasury performed in the face of the crisis but the systemic failures within the financial sector that allowed it to happen, including corporate culture, governance and competition or the lack of it. It may well be argued that commissioning such a report would of itself be a threat to The City, which generates a great deal of money for the country and, though taxes, for the Exchequer. It shouldnâ€™t be. In any case, considering the cost of bailing out failed banks, the net benefit of a dysfunctional financial sector is greatly lessened. If the government doesnâ€™t have much to lose, why hasnâ€™t there been such an inquiry? Partly, itâ€™s want of time – some solutions need implementing as early as possible and canâ€™t (or shouldnâ€™t) wait years for a major inquiry to report. Itâ€™s also perhaps because it wouldnâ€™t be cost-free. Much did go wrong and blame would implicitly be assigned even if only by juxtaposing what the Inquiry recommended against what politicians did or said at the time. No-one was complaining while it was generating massive tax revenue. Commissioning it would be a hostage to fortune. Thereâ€™s also the perceived risk to the UKâ€™s financial sector itself. This is believed to earn great amounts of money both for the economy at large and through taxes for the Treasury. That may well be true for exports but itâ€™s a far more nuanced position where itâ€™s UK-based work (as finance acts as facilitator not producer). Not that that would prevent a lot of special-interest whinging at the prospect of excessive profit and inadequate competition (for example) being addressed. In some ways, the crisis is been so big and so international that itâ€™s not surprising that where questions have been asked, theyâ€™ve been limited. That said, the very act of holding the Leveson Inquiry, never mind the report that will come out of it, has cut out the worst excesses of the media. That lesson could be learned and applied to other sectors too.